Mt. 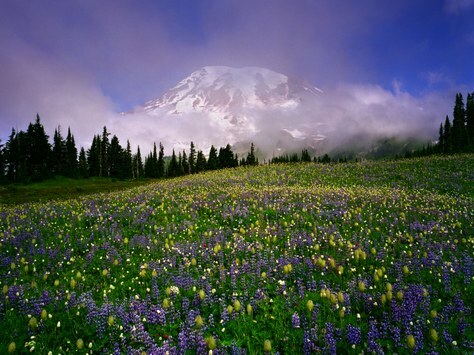 Rainier National Park's online Wilderness Reservation system is not operational for 2016. All Wilderness camping permits will be walk-ups this year. Mount Rainier National Park will process wilderness camping and climbing permits on a first-come, first-served basis in 2016, including permits for hiking the popular Wonderland Trail. The Park’s online reservation system suffered irrecoverable damage during a power failure in a recent storm, making the Park unable to process Wilderness camping permits. MNRP is working with the University of Washington on a new system, which will hopefully be in place by spring of next year. For now, Rainier cannot process the 2,000+ requests for permits it received in the last two weeks. Previously, up to 70% of wilderness campsites could be reserved online. "The ability to make a reservation for popular hikes in the park, especially the high demand backcountry campsites on the Wonderland Trail, is an important visitor service that offers certainty for those planning an overnight hike. Unfortunately, we are unable to provide that service for this summer," said Mount Rainier National Park Superintendent Randy King. In a typical year, wilderness camping reservations received between March 15 and April 1 would be processed in random order starting April 1. Reservations received on or after April 1 would then be processed in the order received. The established "carrying capacity" for wilderness camping in the park dictates the number of permits that can be accommodated annually. Prior to 2013, the number of wilderness reservation requests received at Mount Rainier during the first two weeks of the reservation window averaged in the hundreds. In 2013, requests jumped to 1,400. In 2014, the park received 2,000 requests, and in 2015, the park received over 2,600 reservation requests as of March 31, necessitating a halt to processing Wonderland Trail reservation requests. This year, none of the ~2,000 reservation requests received since March 15 will be processed as a result of the software system failure. First-come, first-served permits (also known as walk-up permits) are required for all wilderness camping in the park. Permits can be issued up to one day prior to the trip start date, or on the start date. Wilderness permits must be obtained in person at the Longmire Wilderness Information Center (7:30am- 5:00pm), White River Wilderness Information Center (7:30am- 5:00pm), or the Carbon River Ranger Station (hours vary, call in advance)." Frontcountry campsite at Ohanapecosh and Cougar Rock Campgrounds can still be reserved online: www.recreation.gov.